Preheat the oven to 350 degrees F and generously oil or butter a muffin tin. Set a mesh strainer over a bowl and sift together the cornmeal, flour, cocoa powder, baking powder, baking soda, sugar, and salt. Microwave the butter on low-power until it's mostly melted and very soft. Whisk in the eggs and emulsify. Whisk the yogurt and milk into the butter and egg mixture until uniform in color. Dump the wet ingredients into the dry ingredients and fold together until well combined. Divide the batter evenly between 9 standard-size muffins. 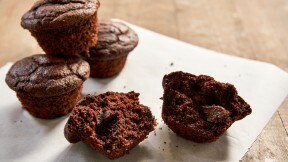 Bake for 20-25 minutes or until a toothpick inserted into the center of a muffin comes out without batter on it. Serve hot, cool completely on a wire rack and store in an airtight container.